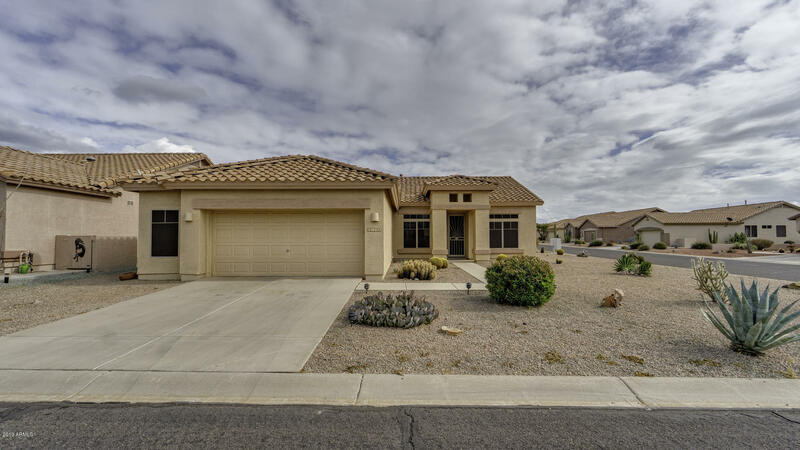 This lovely Picacho model on a corner lot offers an eat-in kitchen with breakfast bar, R/O system, all appliances and even a partial view of the golf course from the kitchen table window. Formal dining room with bay window off the living room and sliding glass door to the back covered patio with BBQ grill, stamped cement patio, and even a partial view of the Superstition Mountain. Master bedroom has separate exit, double sinks, separate tub/shower, private toilet room and walk-in closet. Den with French doors. Inside laundry and washer/dryer convey. 2 1/2 car garage with water softener and built-in cabinets. Sunscreens, 2 security doors and gutters on backside of home. Home comes FULLY FURNISHED. This is an active 55+ community with public golf course in beautiful Mountainbrook Village! !